Donald Lynn Hill peacefully went to sleep on May 14, 2016 and is now fishing in the great waters of heaven. Don was born on May 1, 1946 to Marie (Nelson) and Charles Hill in Portland, Oregon. His father preceded him in death when Don was very young but his earliest childhood memories are of his father taking him fishing on the McKenzie River. Don contracted polio as a young child and spent time in the Portland Shriners hospital. His desire to build boats was fueled by his physical limitations and he built his first boat when he was just 15 with help from his high school shop teacher. Continuing to not allow physical limitations stop him, Don was a high school tennis champion and an avid diver and swimmer. He attended Lane Community College and held a degree in engineering. He worked in the engineering department at the City of Eugene for over 10 years before leaving to operate Don Hill River Boats full time. Don was a very giving individual and never met a stranger. He was a deacon in his church with a strong faith always knowing that he was a fisherman just like Jesus. Don married Sallie Bottem and had two children, Lesa Eusted (David), and James Hill. He had three granddaughters: Kaelene Spence, Shelbi Spence and Madisen Eusted. They later divorced and Don married Wanda Godkin and adopted a son, Kenneth Hill, later divorcing. 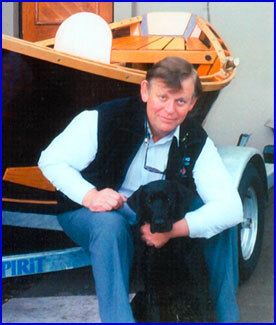 Don was considered a great craftsman in his field and built one of the best wooden boats to ever glide through the rapids of the McKenzie River. He guided and fished many rivers for over forty years. Here is to high sides and dry lines. Fish on dad! A family memorial will be held at a later date. Memorial contributions may be made to the Association of Northwest Steelheaders.